Jul 17 Visiting the Westerfeld House and Its Haunted Past. When I mention the Westerfeld house to people they generally have never heard of it here in Dallas. This is probably because the house is located on the corner of Fulton Street and Scott Street in San Francisco, California. Even I hadn't heard of it until a random purchase I made a couple years back at a Goodwill in Dallas. So, how did a house halfway around the United States peek my interest and a ton of others online and eventually cause me to travel to it? Here's the story. As I've mentioned in other posts, I love thrifting. I'm sure that either makes me a 90 year old grandma or a hipster from Austin, Tx, (but what's wrong with that?) Regardless, a thrifting trip I had with my friend James mid-skateboarding sesh, ended with me and a picture of a strange, spooky-looking house. I'm not sure why, but when I saw this buried among a pile of random picture frames and old, reprinted landscape photos at Goodwill, it seized my attention and wouldn't let go. I purchased it for somewhere around $3.99 and immediately googled the address and the artist's name. Sadly, I've never been able to make out the artist's name, but I did find the Westerfeld on those cross streets. The Victorian house was filled with a rich history that filled every bone in my body with a sense of wonder and curiosity. I was entranced and I had to learn more. 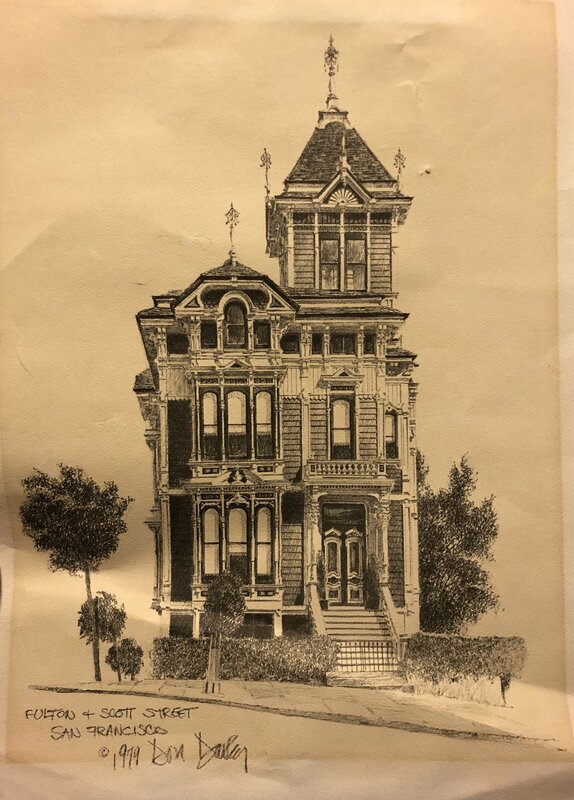 The Westerfeld house was built in the late 1800's by builder Henry Geilfuss on behalf of the home's owner, William Westerfeld. William died in 1895 and the structure was sold to a contractor by the name of Jonathan J. Mahoney who loved to entertain celebrities as guests, (who wouldn't?). The list includes radio pioneer, Guglielmo Marconi, who reportedly used one of the top rooms to transmit the very first radio signals on the west coast. The lineup also included the famous escape artist, Harry Houdini, who experimented in the same room by attempting to send telepathic messages to his wife across the Bay. Fast forward to 1928, when the house was bought by Czarist Russians who turned the place into a nightclub called "Dark Eyes" while making the upper floors into meeting rooms. It was then that it was renamed the "Russian Embassy". In 1948, the night club had shut down and the house became a 14-unit apartment building that was rented to African-American Jazz Musicians, including John Handy. By the 1960's, the house had all sorts of residents inhabiting its many rooms. One of the most interesting occupants (IMO) was occult filmmaker, Kenneth Anger. Because of Kenneth's dark body of work, his visitors lended themselves toward a more sinister nature. This included the famed criminal/cult leader, Charles Manson, as well as Bobby Beausoleil who later joined Manson's cult and was involved in the first Helter Skelter murders. Kenneth would often film his projects in the Westerfeld house where he had carved a giant pentagram into the wood of the top floor. Anger and his friends would also hold satanic rituals in the ballroom. This attracted another famous visitor, Anton Zandor LaVey, who founded the Church of Satan and wrote The Satanic Bible. At one point, they had removed the ceiling in order to create a medium for their dark energies, as well as to view passing UFOs. In fact, many unidentified spacecrafts were claimed to have been seen from the top of the westerfeld, but I'm guessing the amount of drug use probably assisted these sightings. Many more notable characters passed through the hallways of this house while it served as apartments. This included: Mick Jagger, Jerry Garcia, Chet Helms, James Gurley, Janis Joplin, Fayette Hauser, Tom Wolfe, Jimmy Lovelace, Heidi McGurrin, Art Lewis, and Ken Kesey. You can see the full list HERE. In 1969, two men purchased the home for $45,000 and began remodeling random sections of the house. Many odd additions and replacements were made until it was purchased again in 1986 by someone more equipped to remodel an historic landmark like the Westerfeld. Almost two years after I found the drawing in a Dallas Goodwill, My girlfriend (now fiancee) and I traveled to Sequoia National Forest and then to San Fran, where after a lot of walking up and down the insane, but beautiful hills that make up the Castro neighborhood, we came upon the house I'd been dreaming of seeing for some time. The Westerfeld looked like it belonged on r/evilbuildings and yet, it was astonishingly beautiful. As I stood in the park across the street, I felt this wonderful sensation of the house's presence. It was dark, brooding and fantastic all at the same time. One could feel the history emanating from the property. 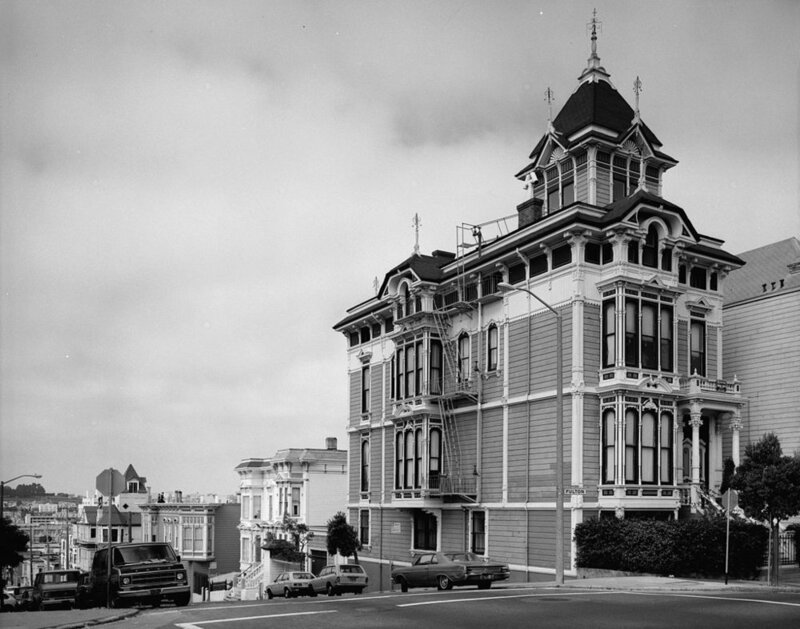 With the famous painted ladies on one side of the park, the Westerfeld stood out as a Victorian structure from another time and vision. I'm not sure a house (other than the one I grew up in) has ever left such an impression on me like the Westerfeld has. I love this house. The architecture; the city it sits in; the history; it all blends to create one of my favorite places and I've never even been inside. One day I'd love to walk through this historic home, but until then, my visit to the exterior will have to suffice. Below are some other angles I captured when I visited. If this post was of any interest to you, you may check out the film currently being made about the Westerfeld House called House of Legends. You can find more information and even donate to the project HERE. Thanks for reading! Hi, my name’s Eric. I’m a writer, actor, musician, and skateboarder living in the north Texas area. Koonagi is a portfolio of my past and current projects. Monica Ortiz: Singer, Songwriter, and Second Album Release. Wait, Eminem has 3 daughters!? #BeingYoungAtHeartMeans I don’t get heartburn from the McDouble and medium fries I sadly had for breakfast. Aug 14 5 Movies That Changed Me. Jun 26 My Interview with Emily Griffin and Her Wonderful Art.